Interlibrary Loan (ILL): What is Interlibrary Loan? 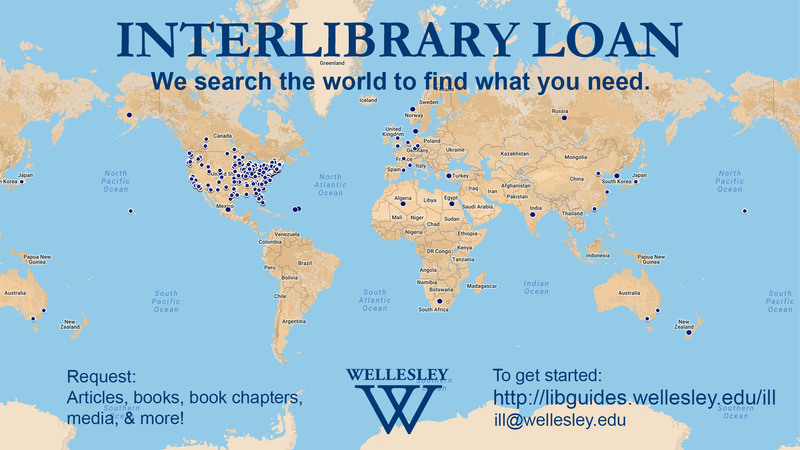 A Guide to Interlibrary Loan Services at Wellesley. Log into your ILL account here! Do you need a resource that Wellesley does not have or that is currently checked out? We can try to get it for you! Interlibrary loan (ILL) is the sharing of library materials worldwide. We find and borrow the resources you need that Wellesley does not have and lend our materials as well. Loan requests will be sent to our library for you to pick up and articles and book chapters are sent to your ILL account as pdfs. Use the tabs on the top to find out more about requesting loans (books, CDS/DVDs, scores) and articles or book chapters. Check the FAQ tab for frequently asked questions.